Picture Hang Solutions specializes in professional hardware for hanging pictures. Since 2005, we have been a trusted resource for many industries that need bulk picture hanging hardware. We serve museums, hotels, hospitals, interior designers, artists, sign makers, moving & logistics companies, photo processors and many others. We are a small business located in Wilmington, North Carolina. Our team strives to source the highest quality hardware at the best prices, while providing you friendly and professional service. We are proud that our hardware stands behind great art and we want you to know that we stand behind every item we sell. 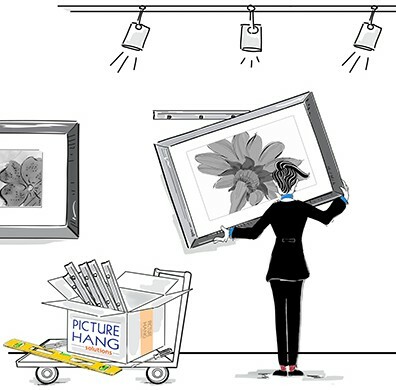 Picture Hang Solutions has been in the art, framing and picture hanging business since 1991. In 2005 we restructured our Chapel Hill, NC retail fine art gallery and custom framing business in order to concentrate on our growing picture hanging hardware division. After many successful years online, in 2015 our office and warehouse moved to Wilmington, NC. Running a busy fine art gallery and custom picture framing operation for many years provided us with extensive picture hanging experience. We installed many thousands of pieces of artwork during that period, both for our own gallery exhibitions as well as for individual and business clients throughout the area. We have a thorough knowledge of the hardware, techniques and methods required for safe and secure picture hanging. For our website we initially selected a group of basic, tried-and-true picture hanging hardware products. Additional hardware and picture hanging related items, including some interesting and innovative specialty hardware, will continue to be added on a regular basis. We try to present the pros and cons of each picture hanging hardware and all the details you need to make a decision. There is no single picture hanging method that will work for everyone in every circumstance and usually there are at least a couple of good solutions to any picture hanging problem. As you may have already discovered, conventional hardware stores tend to carry only a few picture hanging hardware items in small retail packs. At Picture Hang Solutions, picture hanging hardware is our only focus so we have the largest selection of options and we are able to offer deep bulk discounts for your volume orders. We maintain a large inventory and can usually fill all but the largest orders from our stock within a day or two. If you are looking for a picture hanging hardware item that we don't carry, call or email us, we may be able to get it for you. Hanging a picture on a wall seems like a straightforward task--and often it is--but problems or difficulties commonly arise to complicate the task. Our goal is to become the place where simple, practical and affordable solutions to these issues can be found. If you have questions, suggestions or comments, please feel free to email us.